So I thought it would be a really good idea to do monthly updates on my New Years Resolutions to help keep me motivated an accountable. Here's how January went! So my January weight loss total was 3lbs! I'm so happy that I've beat my goal for January! I'm still undecided whether I want to use extra weight loss to hit my goal faster or if I want to use it for some leeway in later months as long as my running total still matches 2lbs per month. I guess we'll find out sooner or later! This one didn't go quite so well as the first one. I was supposed to do no chocolate, no bread and no alcohol. I failed on no chocolate on day 3! I had 1 drink when I went out with a friend on the 25th and I didn't realise pizza counted as bread until I'd had a quarter of one. But after that was pointed out, I just ate the topping off the other three quarters and left the base! So a fail but still much better than it would have been if I hadn't made this resolution. Just think of all the calories I still saved! I haven't found a new job yet. I'm really hoping I can make an income from blogging to allow me to work from home and be with my children. I know this is going to take a lot of work and dedication but I'm up for that challenge! If a job comes up in the meantime though, I'm not silly enough to turn it down. I've rekindled my love of blogging and am loving sitting down in the evenings and writing posts or researching new techniques to help streamline my process and make things a bit easier. Definitely a win so far on this one. I might not be able to do this one until later in the year but I still very much want to do it. Currently, I've only played around with different auto settings. I've learnt that to have any chance of taking a decent photo of Sophie and Samuel, I need to have it set to sports mode as it takes photos faster than the other modes. Eventually I'll learn how to use it in manual mode but let's take baby steps here. Cameras are very intimidating....at least to me! At the moment I haven't managed to blog twice a week but I have scheduled one post a week for 4 weeks and have around 6 posts half written. I'm one of these people that likes to work on multiple things as I can't focus on one task for too long before getting distracted. I think a realistic way to work up to 2 posts a week would be to get 12 posts scheduled weekly and then once I've hit that target, start scheduling for twice a week. That way I have a bit of leeway if I have a busy week. So there you have it! 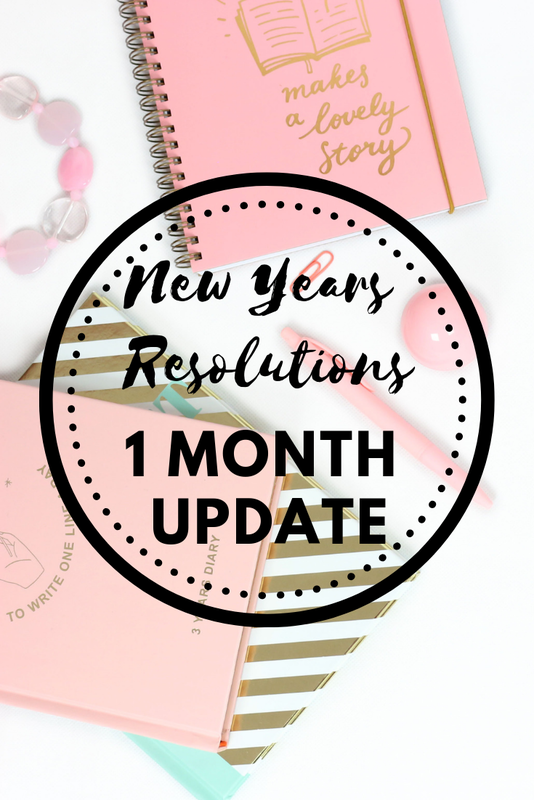 My one month update on my resolutions and I'm pretty happy with how things are going so far! Don't forget to sign up for emails so that you never miss a post. I know you'd hate to miss how February went!